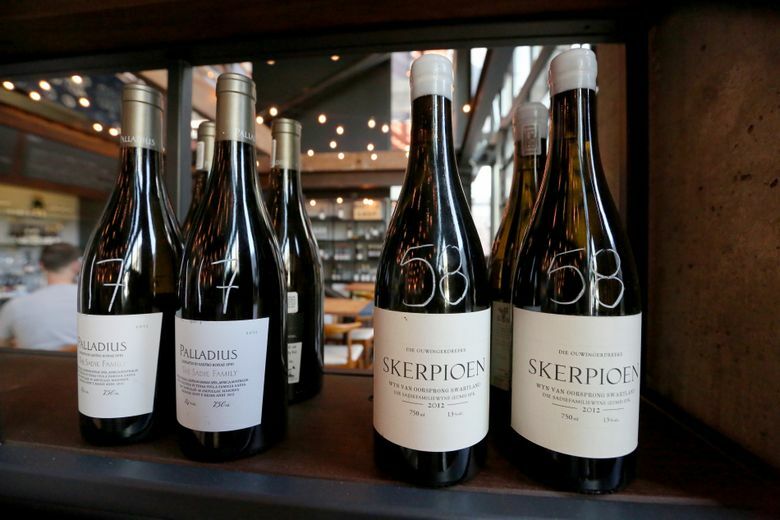 The James Beard Award-winning chef is spending time in the kitchen at his wine bar and bottle shop, and co-owner Marc Papineau expertly pairs each dish with a glass of wine, cider or sake. 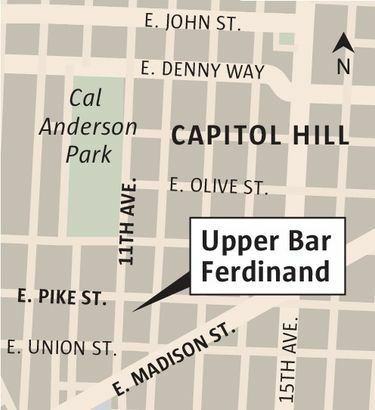 Matt Dillon is cooking four nights a week at Upper Bar Ferdinand, the wine bar and bottle shop he and Marc Papineau quietly opened in March. Adjacent to a spacious courtyard at the far end of Chophouse Row on Capitol Hill, the two-story, glass-walled space is at once rustic and sleek, soaring but surprisingly intimate. For anyone fascinated by cookery and wine, it’s worth seeking out. It’s surprising to find Dillon cooking anywhere. 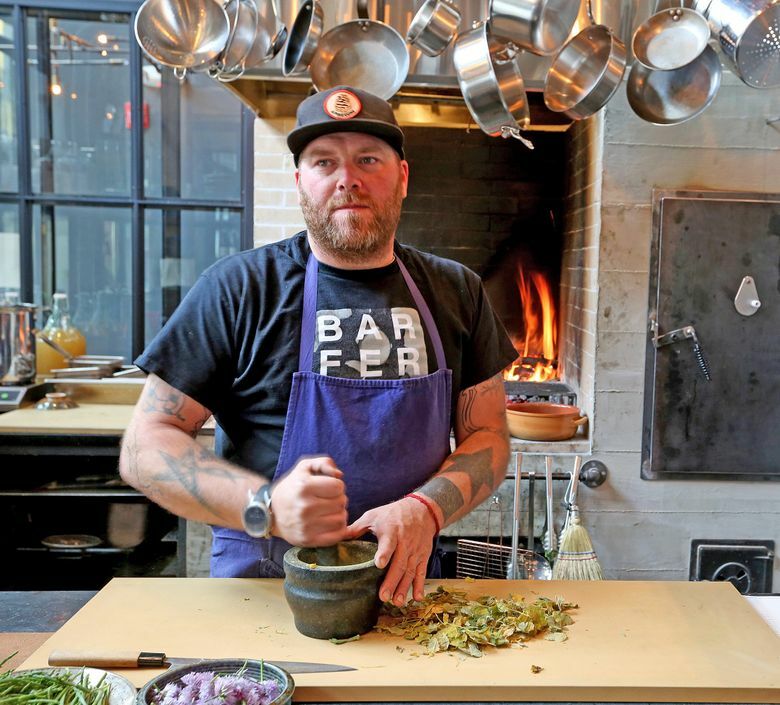 The James Beard Award-winning chef oversees a farm on Vashon Island and five other restaurants: Sitka & Spruce, Lower Bar Ferdinand, Bar Sajor, London Plane and The Corson Building. But Wednesday through Saturday here, he’s “getting back to what I love doing.” What’s more, he’s doing it unamped and largely unplugged, making the most of the farm’s harvest and heeding the call of the wild to create plates that express their own version of terroir. Viewed across a grove of slightly concave tabletops carved from Douglas fir, the kitchen looks like a scene painted by an Old Dutch master. The restless flickering flames, the blackened masonry and sooty aprons, the jars and bottles of murky liquids attest to an ancient alchemy that uses fire, smoke and fermentation to transform food. Vegetables taste just sprung from the earth; seafood tastes just pulled from sand, sea or Sound. Often that’s the case. The menu is so of-the-moment you never know what you’ll find among the 10 or so dishes. Papineau pairs each one smartly with a glass of wine, cider or sake, most by small producers you’ve likely never heard of, in supplies so fleeting the list isn’t even printed; it’s written on a chalkboard. His matches are sometimes counterintuitive, but spot on. He paired Hild sparkling Elbling Mosel with the “bear’s salad,” a bowl of tender wild greens — mâche, wood sorrel and watercress — tossed with crisp wafers of dried pear and a splash of mellow, aged blackberry vinegar. The same crisp sparkler complemented an egg-rich potato salad laced with ramps and the crisp, chopped stems of knotweed. 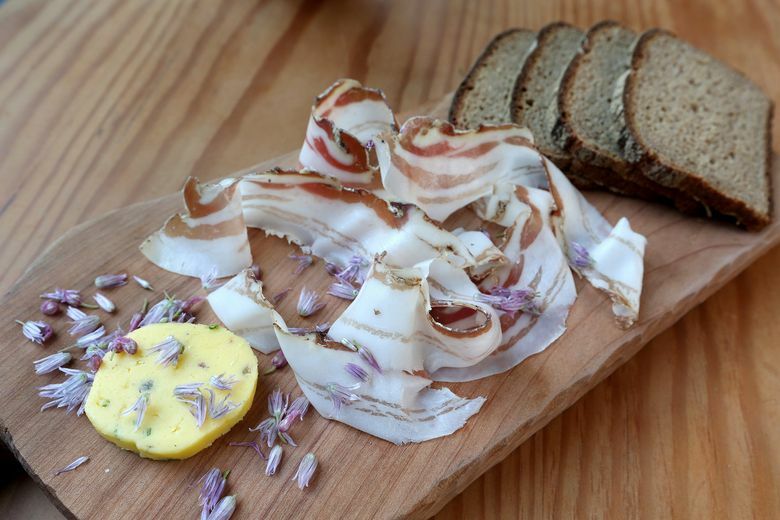 For grilled silver smelt from Puget Sound, sauced with a lemony burst of wood sorrel, he suggested a naturally fermented wine from Oyster River, a horse-powered Maine winery. The same spritzy wine worked just as well with another Sound-dweller, little side-striped shrimp. Served whole, they were offered raw, with salt and lime on the side, or grilled and seasoned with rose hip vinegar and last year’s tomatoes, blackened, dried and pulverized. After a period of fascination with Middle Eastern flavors, Dillon ventures farther east here, so much so that the tables are set with chopsticks, though you do get silverware when appropriate. A spoon was brought for steamed egg custard, a gorgeous take on chawanmushi. The fragile, savory custard was set just enough to support several whole morels stuffed with black cod. A side of grilled nettle stems and ramps further tethered the ethereal custard to earth. 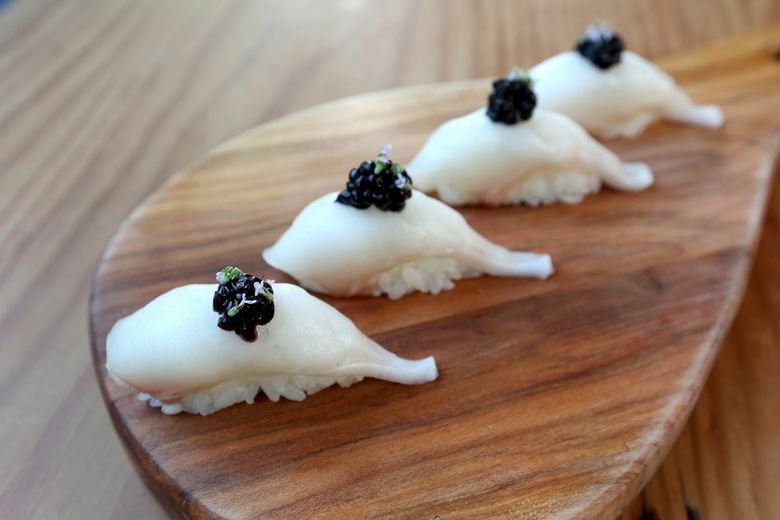 Marinated wasabi leaf graced raw black cod made into nigiri sushi. A Quinault razor clam was sliced and scored for nigiri, too: The back of a half-shell supported the sushi; the other half-shell cupped ceviche made with chopped clam and crunchy beach grass. Sashimi-like slices of kelp-cured halibut dabbed with wild plum sauce and pureed perilla leaf came with a bowl of dark, briny kelp broth — the ocean’s delicious answer to bone broth. The cooking is intentionally elemental. The small staff — Dillon, Papineau, John Terrell Murray, Erin Counts and Sun Hong, soon to be joined by Ashley Morford — shares front-of-the-house, back-of-the-house and sometimes farm duties. They decided to limit electronics to five: a dehydrator and vacuum sealer for preserving, an induction burner for warming broth, a juicer and an ice cream maker. Cooking is done in a smoker or a wood-burning oven, or over charcoal in the fireplace or on the binchotan (a Japanese charcoal grill). Clay-pot rice is finished on the binchotan. The smooth sphere of cooked rice is removed from the pot and burnished to a crisp, golden brown. It comes to the table loosely covered in a sheet of toasted nori that can be used as a wrapper for a bit of rice and spicy, fermented vegetables: watercress, sliced carrots and whole shishito peppers on my visit. Old Chaser Farm provides as many raw ingredients as possible. Potatoes and carrots wintered in hay in the dark at the farm. 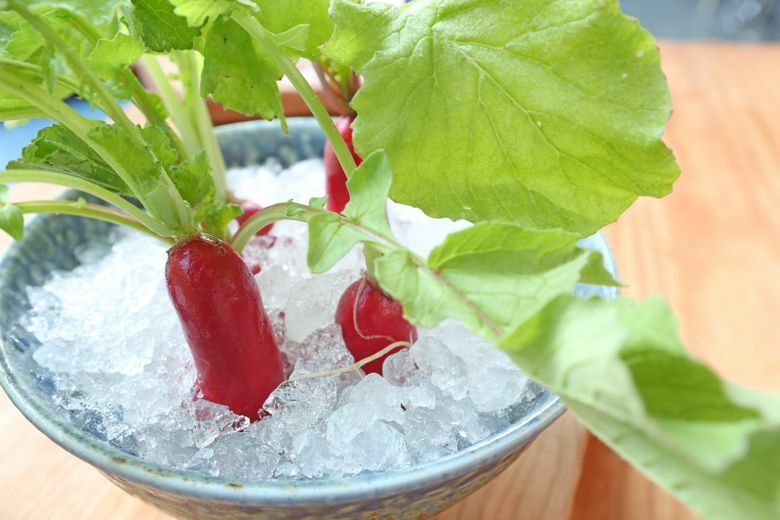 Radishes and fresh herbs are coming up now. Chickens are raised for eggs and also for the oven. I devoured a leg and thigh roasted with “last year’s peppers” and served with tangy yogurt sharply punctuated with sage flowers. The team spent much of last year pickling, juicing, preserving, butchering and curing. They make butter, too. It’s tucked into an oyster shell to accompany pickles made from “old vegetables” and a hunk of London Plane’s incomparable sourdough. They use animal fat instead of olive oil, as much for flavor as for thrift. The acid in a dish is often pickling brine or fruit vinegars made with fresh-pressed farm juice. Refined sugar goes into sushi rice, which they get from California, otherwise they harvest honey or make natural sweeteners, which yields such delights as burnt honey ice cream topped with quince syrup and fresh rhubarb. “The wine shop is a huge part of the business,” he adds. “Gastronomically speaking, a bottle of cider or wine is like the best restaurant in the world to me. One single agricultural crop that captures a specific time and place. I was inspired by that. We are a wine bar. I wanted to show my kinship to those people. That’s why we limit ourselves in the kitchen.” Those restrictions appear to be a catalyst for magic.